The Layer Cake Creative blog is worthy of adding to your bookmarks. 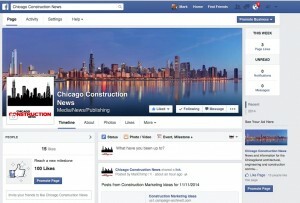 The Chicago Construction News Facebook page. After three months, we have just 15 likes. Many marketers have discovered that Facebook has both real power, and real challenges. You can certainly set up a basic company/corporate page quite easily, and embed some nifty graphics and tools, and then start working to build your ‘likes’ and traffic. But things aren’t quite as easy as they were a few years ago, in part because of Facebook’s commercialization. Natural news-feed likes will be hard to come by unless your site is otherwise already popular — and you are then faced with the prospect of paid advertising. This might be a worthy investment, if your market is geared to consumer-focused demographics, but I’m not sure how much you should pay within the ICI space. Social media has evolved to be a necessary component of your overall marketing strategy. But if your company is on Facebook just because you’ve been told you’re supposed to, don’t expect any results. Like any other component of your marketing strategy, you need to develop a strategic approach to marketing on Facebook. By failing to do this properly you risk devaluing your brand by being seen as unprofessional and annoying. How do you know if you’re chasing away potential fans? 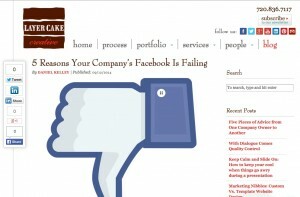 Here are a few reasons why your Facebook page may be be failing. In a world where you see an ad everywhere you look, the last thing you want to do is voluntarily sign up to see ads on your Facebook. Obviously, the end goal of marketing is to increase your revenue, but how do you sell to people without coming off as salsey? A good start is to develop a content strategy adhering to the 70/20/10 rule where 10% of your content includes things like promoting new products or lines, sales, events, coupons, daily specials, etc. Peppering in the salses focused content will help your content be seen by your fans without overwhelming them. The other idea to keep in mind is that if nobody likes being sold to; don’t let them realize that they are. Taking the extra time to creatively sell to someone will not only work, it will also increase people’s positive perception of your brand. So be funny, unique, or even make it into a game. If you’re lazy about it, people will view it as the same thing as getting a flyer under their windshield wiper. When a person is deciding whether to follow your page, you have about 15 seconds to capture their attention. So what does your cover photo look like? Is your company’s information section filled out? What are the first few posts they will see? If you aren’t confident to show someone one of these three things, chances are you won’t capture the fan’s attention and they will be lost forever. So take the time to create content that is visually appealing to your fans. Trust me, it will pay off. One more great way to turn a fan off from your page is to create posts that are very wordy. Think about it, when is the last time you took the time to click the “See More” button on your Facebook’s news feed to read a post that was a few paragraphs long? The sweet spot on text for a Facebook post is between 80-100 characters, so keep it short and sweet. Posting on Facebook is a lot like exercising. If you exercise for 2 weeks, then take 3 weeks off, then exercise again for a few weeks then take another few weeks off, you won’t get the results you’re hoping for. Facebook’s organic reach algorithm rewards pages that post often and regularly, without coming off as spammy. Make sure you get the most organic reach out of your page as possible by creating an editorial calendar to keep your posting schedule in check. This editorial calendar should include how many posts per week you’re aiming for. If your page has less than 5,000 fans, you should aim for about 1 post per day, with a few exceptions. Once your page gets over 5,000 fans you can reassess this. What Does The Fan Get Out Of It? A person’s newsfeed is valuable real estate to them, so they’re going to be picky about which brand’s content makes the cut. So as a marketer you have to ask yourself “what sort of value can I offer this person?” Will fans get special promotions or discounts? Will you bring a smile to their face with entertaining content? Is your brand one that’s seen as so hip or trendy that fans will like your page as more of a statement of their personal values? The key is to find a few ways you can offer value to your fans and focus on those, if you spread yourself too thin it will be hard to succeed with all of them. The key takeaway here is that social media is just as important as every other component of your digital marketing strategy. Underestimating the power of social media by just having a Facebook page or by handing the responsibilities off to an intern will only prove more harmful than helpful. One warning about the excellent suggestions above: They may still not “work” to give you traction. 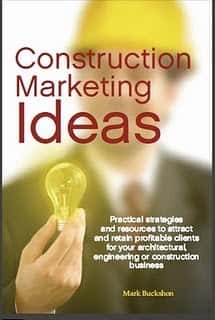 We’ve been working for the past three months with curated, sometimes fun, content for our experimental social media expanded publication, Chicago Construction News. Pretty good results/traffic and interest on Twitter, but nothing much on Facebook. I expect the reason is that we don’t have a large “installed base” and Facebook won’t let us reach out to anyone we don’t immediately know unless we are ready to pay for advertising. 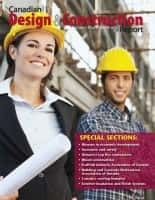 If you want to see for yourself, visit www.facebook.com/chicagoconstructionnews.